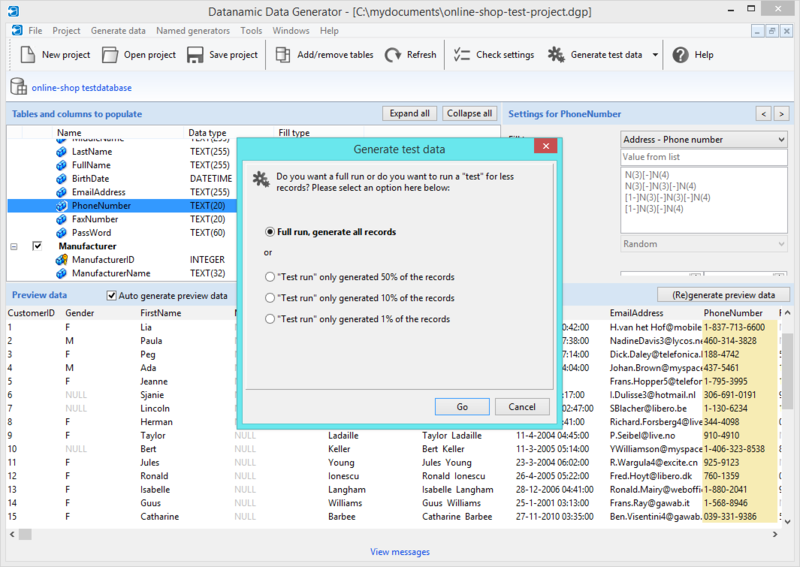 Datanamic Data Generator is a powerful data generator that allows developers to easily populate databases with thousands of rows of meaningful and syntactically correct test data for database testing purposes. An empty database is not useful for making sure your application will work as designed. You need test data. Writing your own test data generators or scripts is time consuming. Datanamic Data Generator will help you. The tool can be used by DBAs, developers, or testers, who need sample data to test a database-driven application. 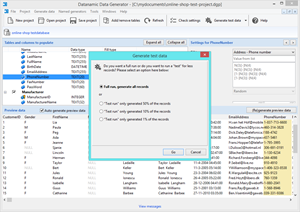 Datanamic Data Generator makes database test data generation easy and painless. It reads your database and displays tables and columns with their data generation settings. Only a few simple entries are necessary to generate comprehensive (realistic) test data. 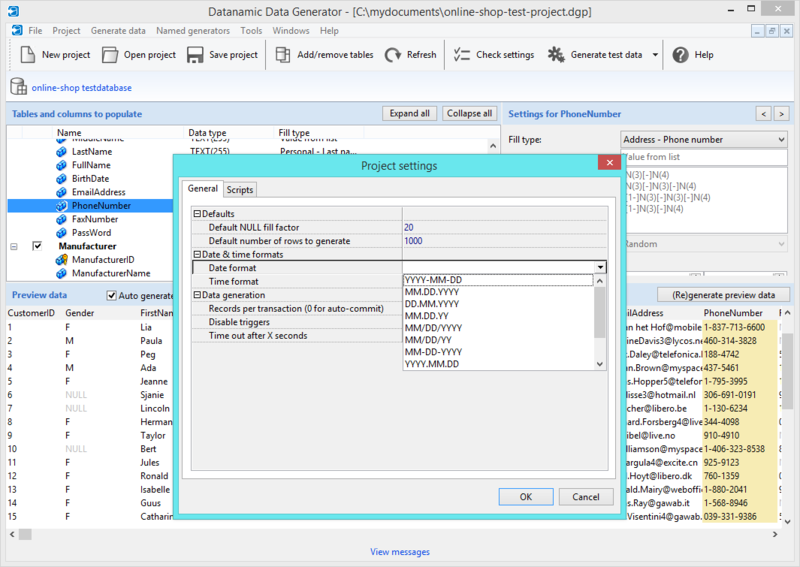 The tool can be used to generate test data from scratch or from existing data. 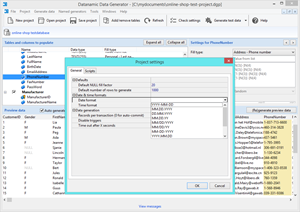 Datanamic Data Generator is a software tool to generate test data for database testing purposes. It inserts generated data directly into the database, or builds insert SQL statements. Below you can find a list of features. MS SQL Server 2000, 2005, 2008, 2012 and 2014. When the tool analyzes your database schema it automatically selects an appropriate generator for each column based on the column name, language used, data type, constraints etc. Ofcourse you cna change the generator for that column if that is desired. A large collection of lists, csv files (with addresses etc), date generators, string generators, expression generators etc is included. 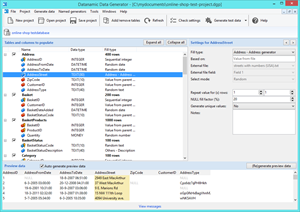 You can reuse data from existing sources such as another table or data in an external file. 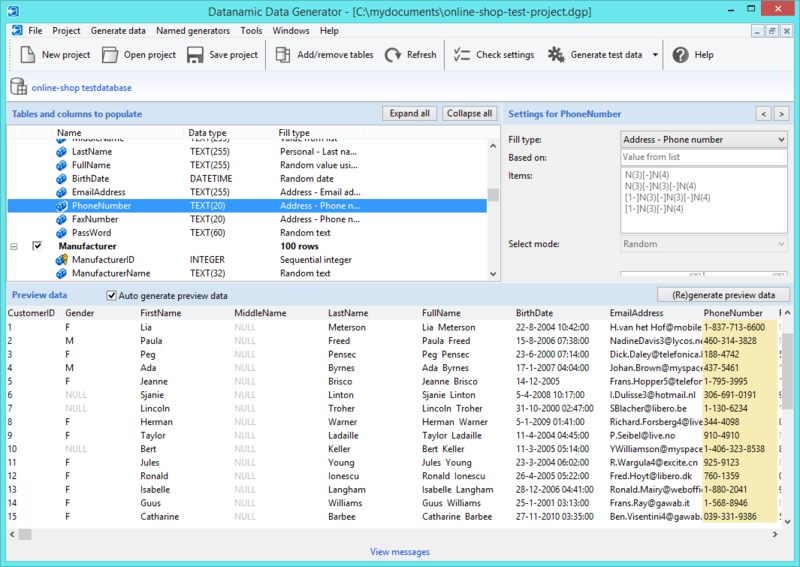 Datanamic Data Generator reads the database schema details from your database. This schema information (metadata) is used for generating syntactically correct data that automatically matches your domain values (data types). When you start generating the data, you can choose to output to the database or to a SQL file with insert statements. 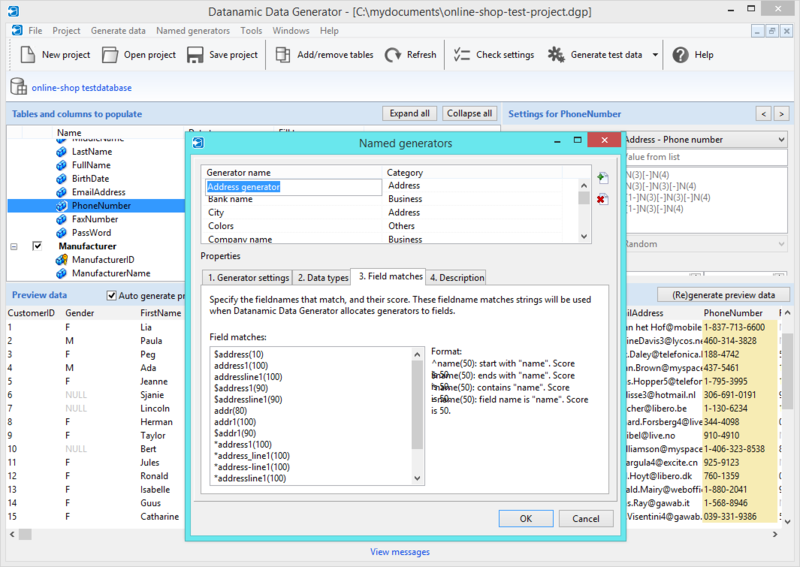 When you have connected to a database, Datanamic Data Generator automatically chooses the most appropriate data generation settings for each field. Ofcourse you can fine-tune these settings but you can also choose to generate data with this default settings. All you have to do then, is clicking the "Generate data" button. 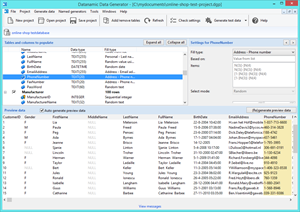 Datanamic Data Generator for racle automatically controls referential integrity for linked tables. When data is inserted, it will be done in the correct order. When a child column is part of a relationship it will by default load random data from the parent column in the parent table. 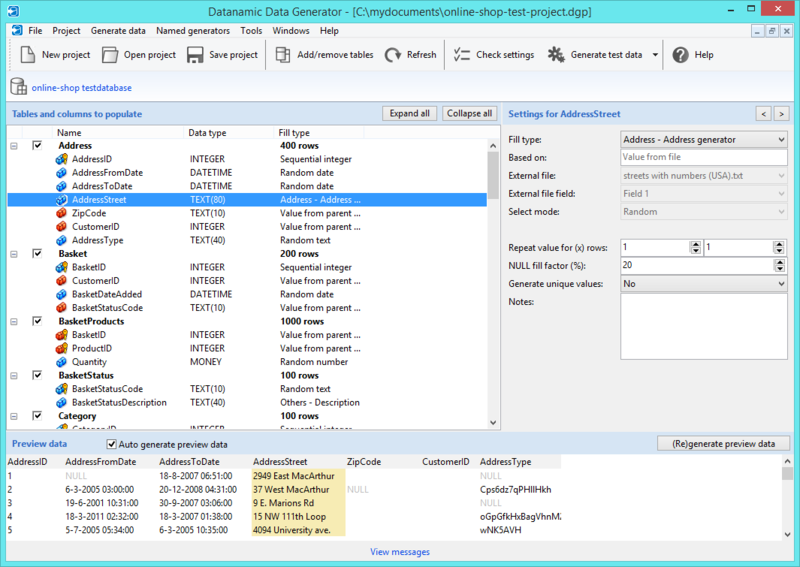 Datanamic Data Generator also correctly handles multi-column foreign key constraints. A powerful way to generate meaningful data that matches your needs is to fill a field using the "Random text using mask" generator. By using the "Random text using mask" fill type, you can generate strings that match a defined pattern. You can use the "random text using mask" generator with any data column that has a data type that accepts a string (char, varchar, clob, string, text, etc...) and user-defined types (domains) based on these string types. Select a data generator you want to use for a field. Preview data that will be generated. 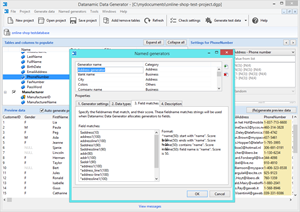 Pricing for Datanamic Data Generator starts at $ 499 for a single user license (EULA).